I made this shortbread at the weekend but didn't get a chance to post the recipe. We were hit by Typhoon Hato today in Hong Kong so we had an unexpected day off work which was quite nice. Once we had finished chasing our outdoor furniture around the roof terrace we were able to enjoy some quiet family time watching movies in our PJs, and doing not much else! It does, however, also mean that I have some extra time this evening to write this post which is a bonus. Being Scottish I do love a shortbread biscuit, but it has to be homemade! This is a family recipe and is absolutely perfect as plain shortbread, but I do like to experiment by adding different flavours sometimes. At the weekend I found some Mars Bars in the fridge so thought I might as well add them to the mix. I think it works very well, I like the contrast between the crumbly biscuit and the chewy Mars Bar. Grease and line the bottom of a 20 x 30cm baking tray. Sieve flours and caster sugar, and mix together in a large bowl. Grate the butter into the bowl using the largest side of a box grater. Use your hands to rub in the butter until it is thoroughly combined with the flour mixture. Mix in the chopped Mars Bar so that it is evenly distributed through the mixture. Press the mixture into the tin and prick all over with a fork. I find that it is hard to get the surface smooth at this stage so I normally remove it from the oven after about 10 minutes and use the back of a spoon to smooth the surface and then prick again with a fork. Bake at 140 degrees centigrade for 1 hour and 10 minutes. Take out of the oven and cut into fingers/squares whilst still in the tray. Put back into the oven and leave overnight or until thoroughly cool. Break the chocolate into pieces and melt with the coconut oil in a bowl over a pan of boiling water. 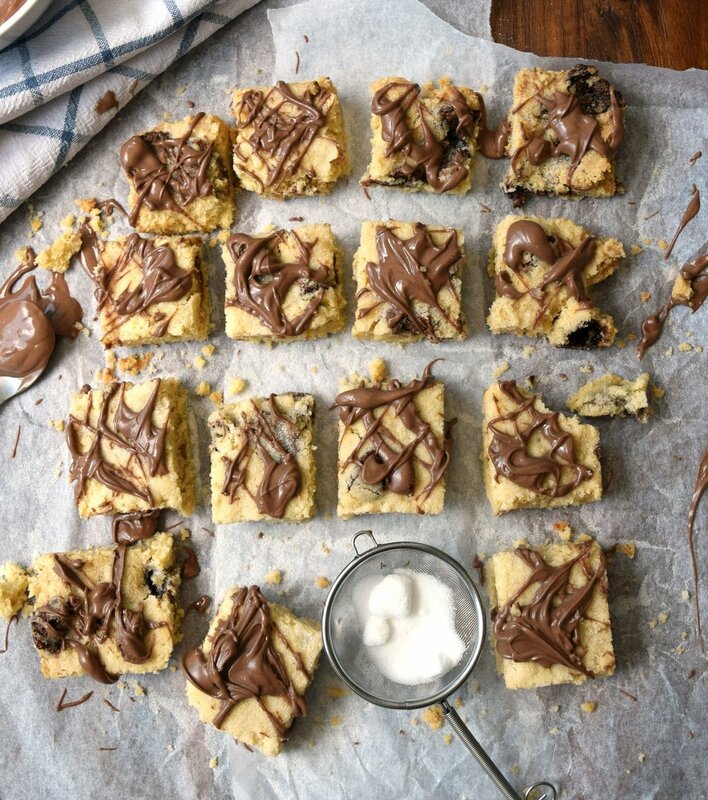 Remove the shortbread from the tray, sprinkle with caster sugar, and drizzle over the melted chocolate.